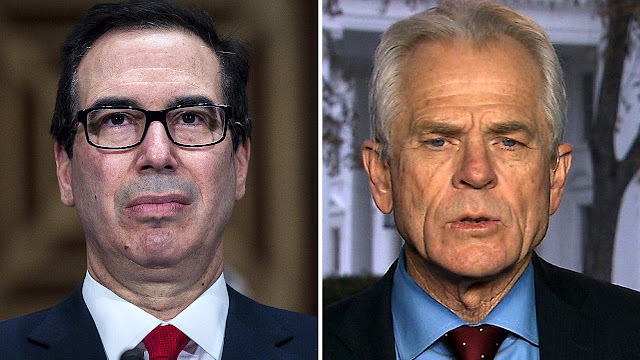 Treasury Secretary Steven Mnuchin’s characterization that the trade war between the U.S. and China was "on hold" was an “unfortunate soundbite” according to White House trade neanderthal Peter Navarro. He took the slap at Mnuchin during an interview on NPR on Tuesday. Mnuchin and Navaro really don't like each other with Navarro being more aggressive about the feud. Reports are that Navarro exploded at Mnuchin during a recent trade negotiation trip to Beijing and more recently Navarro likened Mnuchin to a Nazi appeaser. That said, Mnuchin is no Ludwig Erhard but compared to Navarro he looks like Sir John Cowperthwaite. And Carles Spriggs may have met Navarro.